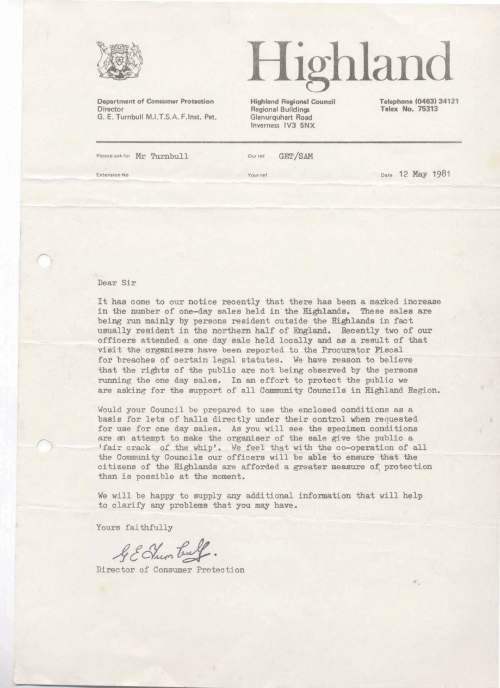 A bundle of Dornoch & District Community Association correspondence April to May 1981. 16 miscellaneous pages ranging from A4 size to slightly smaller letter size, including photocopies, handwritten and headed paper from Highland Regional Council, Sutherland Printers Ltd, Arthur & Carmichael and Macdonald Associates Dornoch. Content of correspondence about the refurbishment of the Social Club and the issue of one day sales.